Sources within Hutcheson tell LU the hospital laid off at least 20 employees Thursday, mostly from support and mid-management positions. Hardest hit departments were radiology and ICU. Parkside Nursing Home lost its nutrition and housekeeping supervisors. HMC’s supervisor of engineering was cut loose. The entire outpatient nursing department was shuttered, and another source says the hospital will no longer run an operating room at night for emergency room patients. A lot of managers who DIDN’T get laid off are going to be covering jobs for those who were. 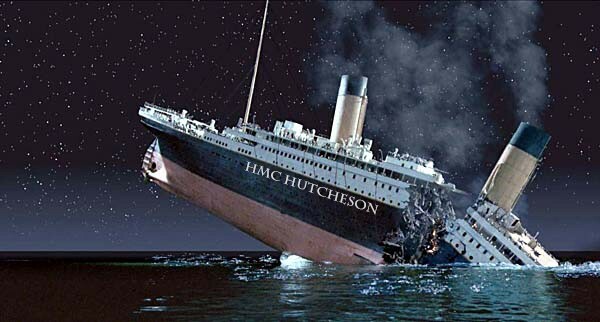 Also rumored to have been cut: Tammy Cole, director of the Hutcheson Foundation and the hospital’s recent PR contact. She’s the one who’s been sending e-mails for the CEO and press releases to the media. But still no buyer for the hospital. Police removed a student from a Walker County Schools bus Thursday morning after an unidentified 17 year old girl “became unruly” and threatened other bus riders. She was arrested after leaving the vehicle. The bus was in the Chickamauga area carrying students from Ridgeland, Chattanooga Valley Middle, and a few elementary kids – all arrived at their respective schools a little late due to the disturbance. Preventing crime, or abusing the mentally ill? 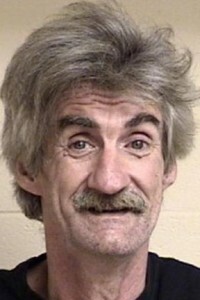 WQCH Radio, 09/25/15: “A LOCAL HOMELESS MAN WAS CHARGED WITH LOITERING, AFTER POLICE GOT SEVERAL CONCERNED CALLS THAT HE WAS ‘LOOKING INTO PARKED CARS’ AT THE SONIC AND BI-LO PARKING LOTS IN LAFAYETTE. 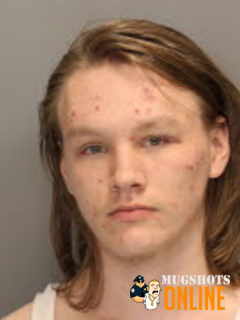 “20 YEAR OLD STEVEN AUSTIN HULSEY WAS ‘COVERED IN BLOOD’ WHEN POLICE STOPPED HIM. HE SAID HE HAD BEEN BEATEN BY A COUPLE OF PEOPLE WHERE HE’D BEEN STAYING ON GLENN STREET. Some argue that Mr. Hulsey is a mentally disabled man who needs care, not jail. But if LPD did nothing while he wandered around looking inside cars, people would be asking why they didn’t do anything to prevent yet another vehicle break-in. Unfortunately, in Georgia, this IS how we care for mentally disabled or disturbed people now. The state closed most of its mental hospitals and replaced them with “community care” several years ago due to an order from the federal government. “Community care” means we let troubled people wander around until they break a law and then they get to sleep in a cell for a night or two. Hulsey is already back out and will likely be doing the same thing again soon. During the September council meeting, LaFayette’s elected leaders decided to hold city property taxes steady. They didn’t approve a final city budget for 2016 but will meet again before October 1 to finish one. They also voted to purchase two new patrol cars for LPD. 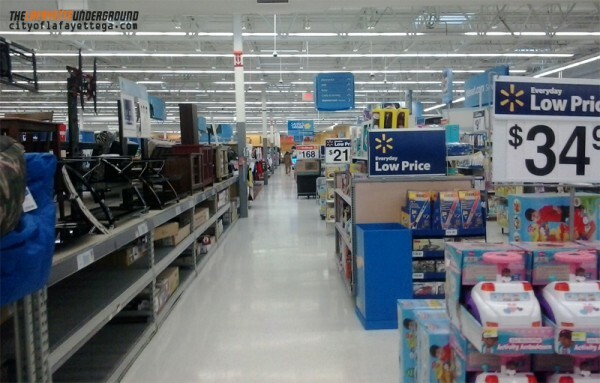 Valerie Kaye Howell went to jail last Wednesday for allegedly switching price tags on items at Walmart. She paid for the mispriced items but didn’t get to keep them, plus went to jail for about $200 of junk. Howell was arrested again, a day later, charged with more theft after allegedly stealing money, cards, and medication from her (now ex?) coworkers at Five Star Food. More citizen complaints about Commissioner Heiskell’s financial leadership. This is the first letter like this in a LONG time we’ve seen published in the Messenger, and it’s not because people haven’t been writing them. LPD officers responding to a domestic violence case last Friday tased and arrested Billy Wayne Corbin for throwing furniture and threatening to kill his wife. 54-year-old Magnolia St. resident was mad at her for “stealing” items he misplaced the night before while intoxicated. Plus: Walker jail report, September 17-23. A Ringgold family whose home was leveled by the 2011 tornadoes still waits on a replacement. Now they’ve taken a LaFayette Business – Southern Log Wholesalers – to court for taking their money and not finishing construction on the rebuild. They say the company took over a quarter million dollars from them and then stopped showing up to work. The company’s former owner says his family sold the established business in 2011 and the new owner (the owner being sued) turned it into a scam. Last night LaFayette football lost to Northwest Whitfield, 24-0 in its first region game. LaFayette falls to 1-3 for the year, 0-1 in region play. A senior kicked off the Northwest Bruins team for torturing chickens was back playing because felony charges were dropped against him after he took a deal. Dirty, dirty. Ridgeland lost to Pickens, 17-10. Chattooga beat Armuchee 44-0. Trion whipped Kings Ridge Christian, 61-0. Gordon Lee lost to Darlington, 56-35 in Rome. A handful of Georgia prison guards and inmates face federal criminal charges for smuggling mobile phones into jail cells, where they were used to buy drugs and commit crimes online. This weekend IronMan will return to Chattanooga and Walker. 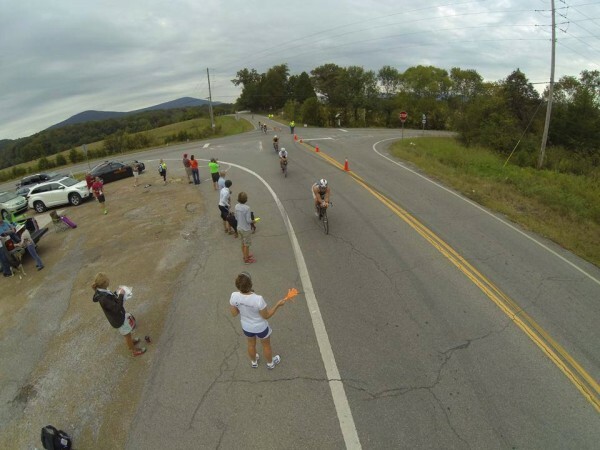 The race will again have a Walker County bicycle portion, but it won’t be on Lookout Mountain. Participants on Sunday will go along 193 from Tennessee, down Cove Rd, then back up Hog Jowl twice – stopping short (and bypassing) Mountain Cove Farms. Here’s the spectator guide which includes a route map, and here’s a projection of road impacts – basically 193 and anything that crosses it, from 5 AM to 6 PM, tomorrow. The city of Calhoun has been pulled into a lawsuit over its practice of INDEFINITELY jailing people who can’t pay steep bonds for minor crimes like jaywalking or public intoxication, in advance of their court dates. Essentially, jailing the poor. Now the plate is coming back, possibly next week. 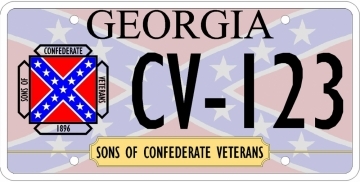 So far there’s no leak of what the new politically corrected design will look like, but you can bet it doesn’t feature the flag nearly as prominently. The article says the background image of the flag is gone and the organization’s logo has been modified. Did you get a vacation this year? If so, did you pay for it? Many Georgia legislators got more than one, often for free. Some paid for trips and got meals or perks free while there. 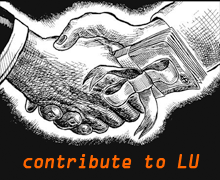 Jeff Mullis isn’t at the top of the list, but he’s gotten over $1,000 in freebies this summer. 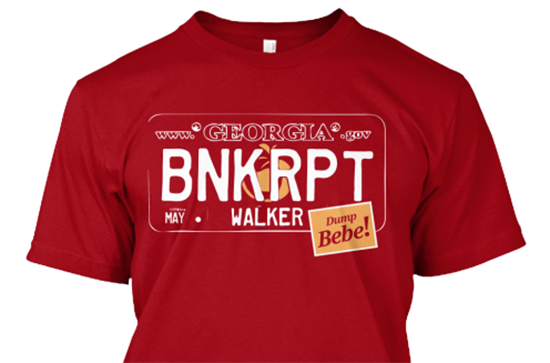 Time is running out – order your BNKRPT Walker t-shirt by October 1st. Regardless of what the public thinks about “transgender” people, Georgia has to set consistent rules in place to address them and their needs, or at least figure out how their complaints and concerns will be considered. Public restrooms, schools, prisons, and everywhere else in society – transgender citizens aren’t going away, and the state has to decide what policies it will apply to them. Another thoughtful piece from The Perspicacious Conservative. Georgia recently sued a California non-profit for putting the state’s code of laws and compiled court decisions online, for free. The state says that tax-funded material should only be available for $378, and accused the charity of “terrorism” for putting the documents online. Now the charity, PublicResource.org, has filed a countersuit demanding a jury trial to decide if the state can legitimately claim a copyright on the material. If the state wins this case, it will be a huge blow for government transparency. All the state (or the counties) will have to do is “copyright” something to make it exempt from open government rules. A group of parents and drug advocates – Georgians for Freedom in Healthcare – is pushing the state to expand laws providing access to marijuana-derived medications. 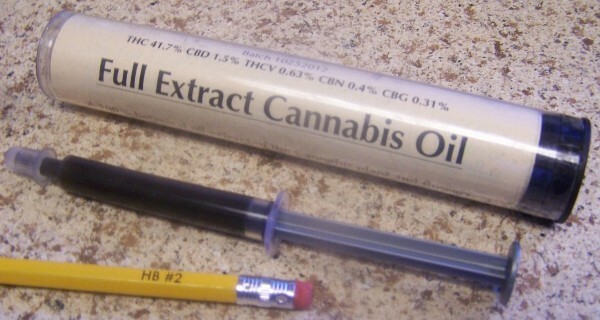 About 200 people have signed up for the state’s Cannabis Oil license program since it began in July, which means they can avoid being charged under state law if found with the low-potency oil, but state and federal rules still don’t allow them to actually make, or bring in, marijuana related products in Georgia. Georgia’s tax revenues shot up in August compared to a year earlier, mostly due to changes made to the state gas tax. When the legislature meets in January they’ll have no problem finding new ways to blow the money on foolishness. I have emailed the news to help out walker county and have heard nothing. Everybody needs to blow news 3 ,9 and 12 phone up to help run an investigation on the commissioner to see that she is bankrupt the county and making it so we can’t afford to live here.